Clemson University is committed to providing a safe, attractive, educational and sustainable campus urban forest through preservation of existing trees and new tree plantings. A tree may be considered for removal for any of the following reasons: it is determined to be dead or diseased beyond preservation; its location, condition, or deterioration constitutes a safety hazard; its location affects the preservation and maintenance of adjacent buildings; the tree is damaged from the elements or disease to the extent that its appearance is unduly affected; its location is determined to be an obstruction or hazard to utility lines; its location interferes with the construction of facilities and associated site development; or for other appropriate reasons. The determination of trees meeting the above conditions is the responsibility of the Director of Landscape Services in consultation with the University Arborist and independent arbor consultants. The map below shows our plans for new tree plantings. Landscaping Services also performs a yearly risk management inspection of all inventoried campus trees. Upon the completion of this year’s inspection, our Consulting Arborist recommended the trees for included in the map below removal. These trees pose a significant risk of failure and have the potential to cause personal injury or property damage. Map not loading or too small to see? View the larger version at Google Maps. Trees recently approved for removal are listed below. All removals are in accordance with the Main Campus Urban Forest and Landscape Management Policy and Main Campus Urban Forest & Landscape Management Plan. Trees adjacent to construction areas will be protected as prescribed within. 3 trees and various groups of Crape Myrtles will need to be removed for implementation of the Perimeter Road Temporary Asphalt Path Project. Project created for pedestrian safety for those who utilize the new R-6 parking lot to walk to campus. Trees adjacent to the construction area will be protected as prescribed by the University Arborist. Multiple pine trees of various sizes will need to be removed for implementation of the Clemson Rowing, Public Access Expansion, Additional Parking project. Desirable trees adjacent and in the construction area will be protected as prescribed by the University Arborist. Removed trees will be harvested and delivered to Clemson University Forestry. Trees will be replaced based on a new design by Beeson-Rosier Group in consultation with Barrett Anderson, Campus Landscape Architect. Multiple pine trees of various sizes will need to be removed for implementation of the Snow Outdoor Center New Drive and Parking Area project. Trees adjacent to the construction area will be protected as prescribed by the University Arborist. Removed trees will be harvested and delivered to Clemson University Forestry. Trees will be replaced based on a new design by Land Planning Associates in consultation with Campus Landscape Architect Barrett Anderson. 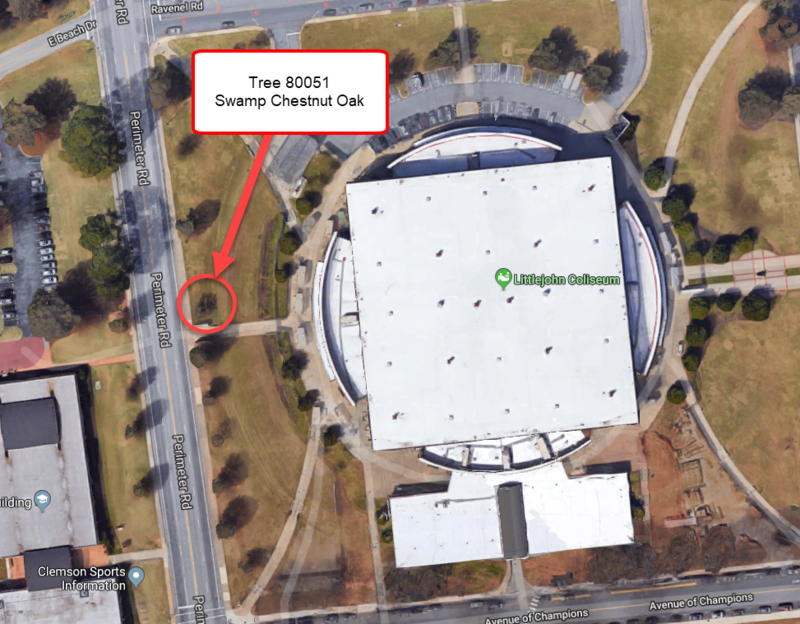 Tree 80051 is a 12" Swamp Chestnut Oak located along Perimeter Road near Littlejohn Coliseum that will be removed to allow for the installation of digital signage at this location. This particular tree has about 40% of the crown compromised by either squirrel damage or sun scalding. Bark has been stripped or scalded from the limbs and this tree is very stunted in growth compared to others planted at the same time. Several trees will be removed during Package B of this project. In preparation of the Duke Energy Combined Heat and Power Plant (CHP) facility, several trees will need to be removed from the R-1 parking area to facilitate site grading and utility construction for this facility. Construction and tree removals are expected to begin mid-May 2018. Tree removal and construction will be performed by Duke Energy Contractor, Crowder Industrial Construction. In preparation of the first phase of the campus Electrical Distribution System Upgrades and Replacement Project, several trees will need to be removed that are in the path of the work that will be taking place along Walter T. Cox Boulevard near Sikes Hall and the sidewalk which runs from Sikes Hall to Long Hall. In addition, a grove of pine trees adjacent to the western side of the West Energy Facility will need to be removed in order to facilitate the construction of the new West Campus Switching Station (WCSS). All of these trees will be removed by Bartlett Tree Experts in December 2017. In preparation of the second phase of work associated with the University electrical upgrade project, a white oak and a willow oak are scheduled for early removal over Christmas break 2018. The trees will be removed by the University Landscape Services Department.